With billions of dollars in cash on the sidelines a rising market, FOMO, will draw investors back to equities. FOMO, fear of missing out, is no reason to get bullish on the market but it is an addition to momentum that could send this bull market up to retest the all-time highs. Earnings season is at hand, the results are so far good, and market action says more good is yet to come. Equities had been edging higher most of the day after a slightly negative open. The positive vibe was enhanced late in the day on reports the US could lift tariffs on China during the negotiating process. This, along with a meeting between top negotiators scheduled for later this month, is evidence we are indeed on a path to satisfactory resolution. Fingers crossed we stay on it. A Treasury official did later refute the report, but the market didn't believe them. Today's market shrugged off an earnings miss from Morgan Stanley that is pretty telling. The investment bank missed on the top and bottom lines due to weakness in trading-related revenue and wealth management. The miss was a bit of a shock at first but, considering MS is only an investment bank, no consumer banking services, it really wasn't a surprise. The financial sector, as a whole, has produced a mixed bag of results in which trading-related revenues were weak but consumer segments were strong. In terms of earnings, the trading-related shortfalls are a rear-looking gauge of activity in the 4th quarter while strength in the consumer points to steady growth for the institutions that serve them. The government shutdown wears on. The talk today was about a growing number of Democrats making comments in support of some form of border security. If Pelosi and Schumer aren't careful Trump will force the Congress to comprehensive immigration reform and they'll lose their pet issue while getting labeled as obstructionists. They don't want Trump to win with his wall? Well, the people want the Congress to DO something about immigration instead of perpetuating the problem like they always do. Does immigration reform have to be a wall? No, it doesn't. Looking on the standoff from the perspective of negotiating Trump probably doesn't really want a wall, it's not smart to ask for what you want because when you reach compromise you won't get it; better to ask for what you don't want. Today's data included housing starts and building permits but both were delayed due to the shutdown but I'm going to go out on a limb and say this, based on the recent surge in mortgage applications that are driven by falling interest rates the permits and starts data may be weak this month but likely to show marked improvement over the next few months. 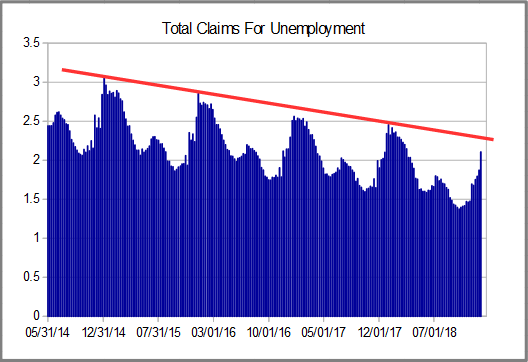 Initial claims for unemployment continue to trend near their long-term low. The data shed -3,000 this week to hit 213,000 which is only about 10K above the low. 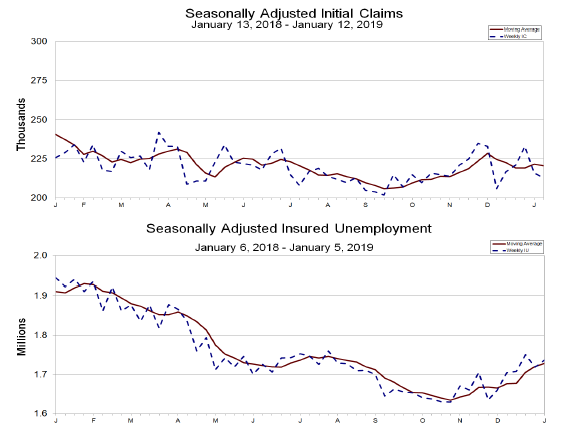 The four-week moving average of claims fell -1,000. On a not-adjusted basis claims fell -0.9% versus an expectation for +0.6%, not-adjusted claims are down -2.5% from last year. The not-adjusted YOY comparison has narrowed sharply this week but it does that from time to time so no worry there. The number of continuing claims increased by 18,000 to hit 1.737 million. The last week's figure was revised up by 3,000, the four-week moving average is up 8,000, and it looks like both could continue moving higher in the near-term. The report shows significant increases in both Federal and civilian-employed government workers, most likely due to the shutdown, which will continue to affect the numbers into the foreseeable future. The total number of jobless claims jumped 279,000 in the final week of December as holiday hires were sent looking for new work. The total number of claims is now 2.106 million and completely in line with expectations. We can expect to see this number move up over the next 2 or 3 weeks with an expectation it will top out near 2.25 or 2.3 million. The Philly Fed's MBOS shows manufacturing activity increased last month. Businesses report increasing demand for their products and are optimistic about future growth. The activity index rose 8 points to 17.1 and new orders rose 8 points to 21.3. The shipments, delivery times, and unfilled orders indices were all positive but lower from last month. Employment fell the most, down -10 points to 9.6, but the number of hours worked rose offsetting a sharper slowdown in hiring. On the price front, input prices continue their slowing trend. 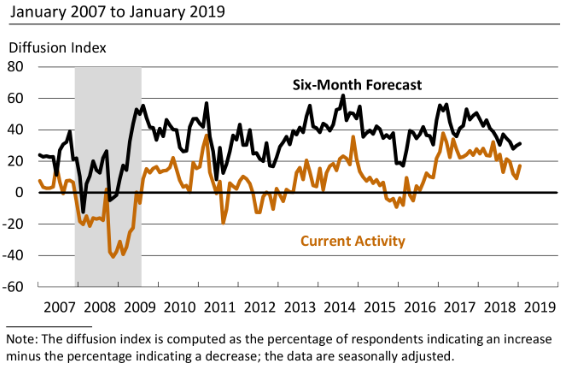 The inventory data turned negative this month, the first time in over a year, as businesses struggle to keep up with demand. 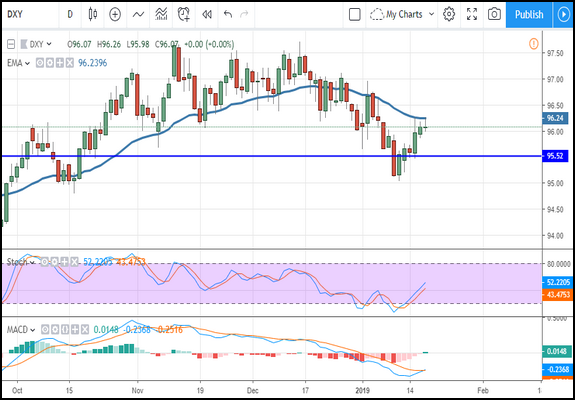 The Dollar Index was able to edge higher in today's trade but the move was capped by resistance at the short-term EMA for the third day in a row. Today's action was impacted by the Philly Fed data which shows declining inflationary pressure among the regions manufacturing businesses but was offset by equally weak inflation data from the EU. EU headline CPI fell to 1.6% YOY in the last month and the lowest level in over a year. The news was as expected but raises doubts about the ECB's plans to begin hiking rates later this year. The ECB is set to meet next week. Until then, resistance for the DXY is at the short-term moving average, a move above it may be bullish but only within the trading range. Upper targets would be $96.50, $97.00, and $97.50. A fall from this level would confirm the near-term downtrend (within the trading range) and could take the index back to $95. Gold prices continue to consolidate within the congestion band near $1,290. 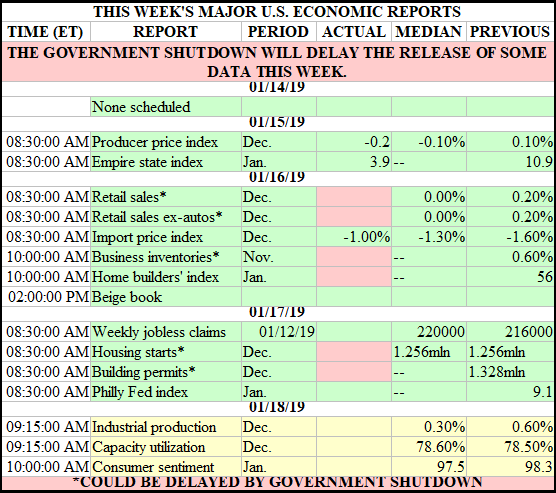 The market is waiting for a number of events to conclude, including the shutdown, the ECB meeting, the FOMC meeting the following week, and an upcoming high-level trade meeting. Until then, gold may continue to trade within this range but I'm not counting on that. A move up and above the $1,300 level would be bullish, confirm the recent uptrend, and set a target near $1,340. A fall from this level that closes below $1,280 may be bearish but would then need to move below the short-term EMA where support is likely to be found. 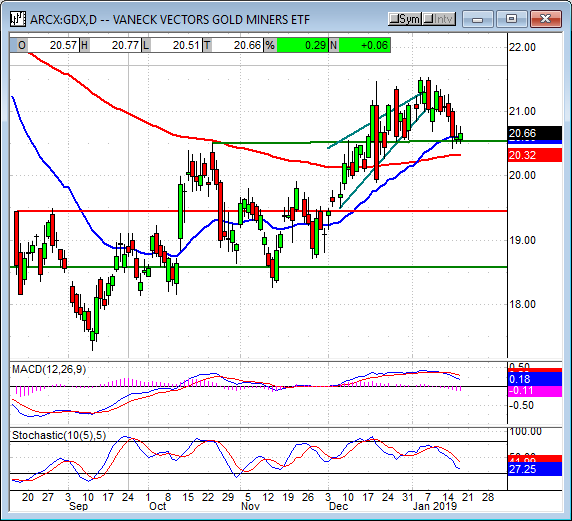 The Gold Miners ETF GDX moved up in today's session with an advance near 0.50%. The ETF appears to be confirming support at the key$20.50 level but the move does not look strong, not yet. The indicators are moving lower so a retest or deeper test of support at this level may come. 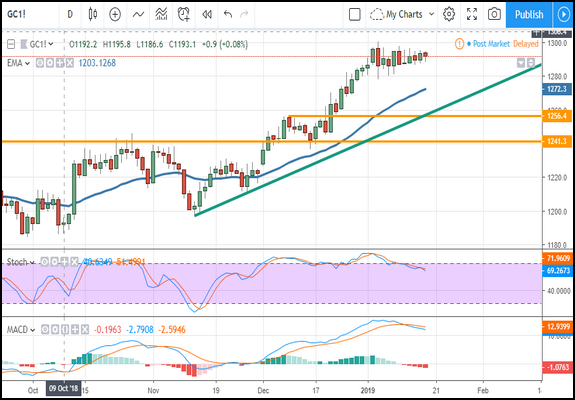 The support is bolstered by both the short and long-term moving averages which could produce a strong bounce should gold prices remain firm. A fall below $20.30 would be bearish. The oil price held steady in today's session as conflicting news offset each other. On the one hand, OPEC says its production fell nearly 750K bpd in December and lowered its forecast for 2019 demand. The cartel now says demand will be about 31 million bpd which is down about 900,000 bpd from 2018. On the other hand, US production climbed to just shy of 12 million bpd as producers continue to ramp up capacity. The increase is worth about 2 million bpd over the last two years. WTI continues to trade within the near-term congestion band while traders wait for a clearer indication of oil prices in 2019. The Oil Index advanced 0.80% in today's session but remains within a congestion band. 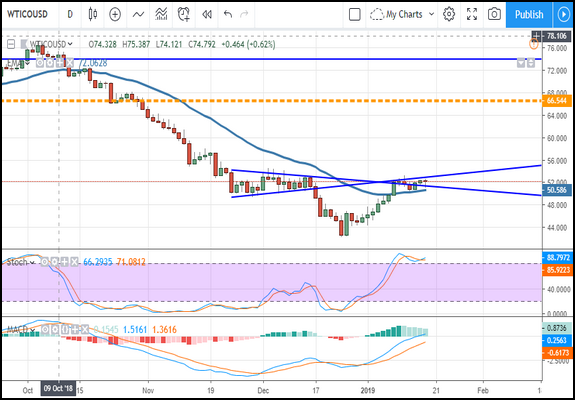 The index appears set to move higher but that is dependent on oil prices, earnings from the oil companies, and the results of trade talks later this month. The indicators are bullish but have begun to roll over so we should expect consolidation to continue in the near-term at least. Support is currently at the short-term moving average near the 1,230 level, an important support target from early in 2018, while resistance is just above at the 1,260 level; a break beyond either will be significant for future price movements. 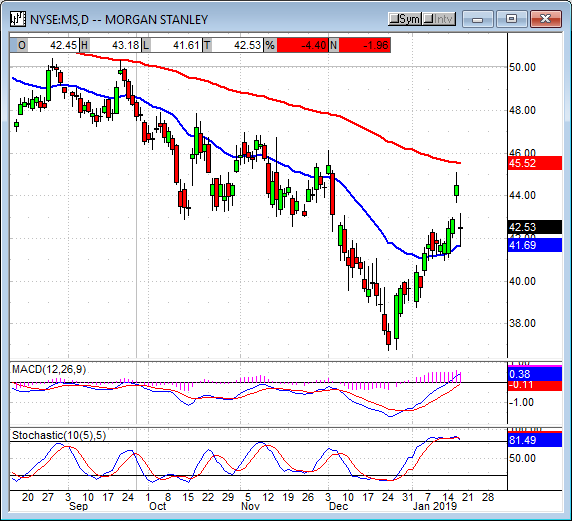 Morgan Stanley reported before the opening bell and missed on the top and bottom lines. The fourth quarter revenue fell from the sequential and year-on quarters largely due to weakness in fixed-income trading revenue. Other areas of weakness include wealth management and Institutional Securities. The only bright spots within the report were Investment Banking, virtually unchanged, and Investment Management, up 7.0%. Shares of the stock fell -5.0% on the news but found support at the long-term moving average on general optimism for 2019. Netflix reported after the bell with mixed results; the revenue fell slightly short of analysts expectations but EPS beat by a nickel. Total net additions were a bit of a miss but come with a caveat, the company is switching from reporting total additions to total paid additions which has had some effect on the data. What the headlines don't show is that total revenue grew 35% over the last year while operating profits nearly doubled. The problem with the report is that outlook for Q1 2019 is a bit light of expectations, shares of the stock fell -4.0% on the news. Based on the wickedly large move the stock has made over the last few weeks the after-hours sell-off is likely a good buying opp. 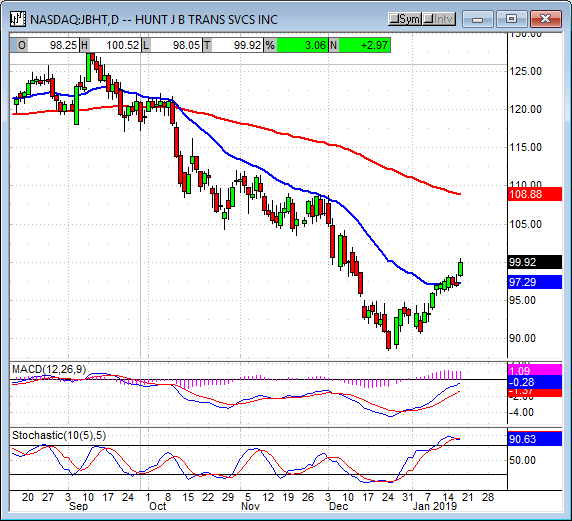 Trucking and intermodal shipping giant JB Hunt also reported after the bell and also delivered a mixed bag of results. The company says revenue grew more than 16.5% from last year and beat consensus but EPS was a big whiff. EPS of $0.81 missed by $0.67 due to the follow-on effect of estimating the benefit of lower tax rates in 2017. Aside from that the results look good, total revenue for the year is up 20% on expanding US economic activity and on track to rise in 2019 as well. Shares of the stock surged more than 4.0% on the news. 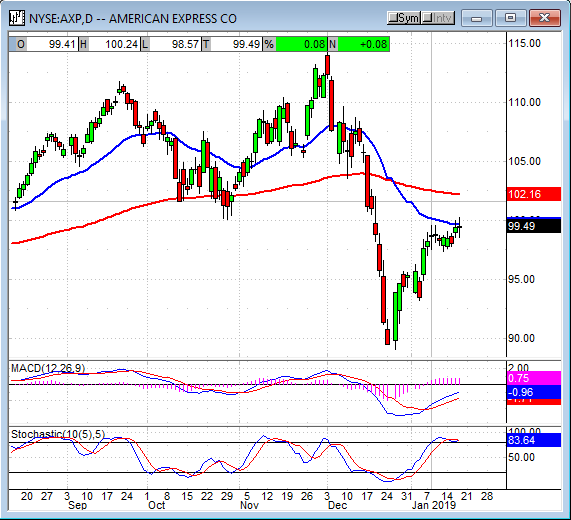 American Express also reported after the bell and did not meet expectations. Granted, those expectations were high but the misses were small and did not warrant the -4.0% decline in share prices. Net revenue of $10.47 billion increased 7.9% over the last year but fell short of consensus. On the EPS side, GAAP earnings beat by $0.50 while non-GAAP missed by $0.06. 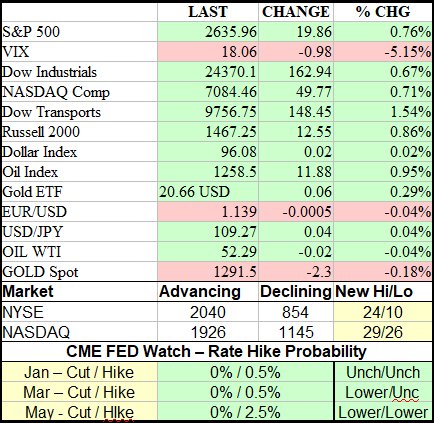 The indices got off to a slightly shaky start but earnings, outlook, and tariff news helped drive them to new highs. 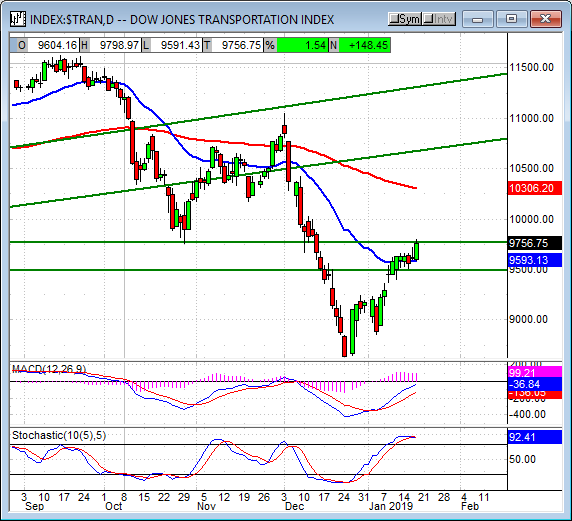 The day's leader is the Dow Jones Transportation Average with a gain of 1.54% that brought the index to the brink of confirming the bullish reversal. Today's candle is medium and green, moves up fro yesterday's support, but halted at the 9,760 resistance level. This resistance level is important because it is the baseline for a potential reversal pattern that has already been confirmed in the broader markets. A move above this level would be bullish, a fall from it could result in a retest of support. The S&P 500 posted the second largest gain with an advance of 0.75%. The broad market index created a medium-sized green candle that moved up from the baseline of a VEE bottom reversal to set a new high. The index is moving higher on earnings driven momentum and indicated higher. The MACD and stochastic have shown some weakening but both are high in their respective ranges consistent with bull-market conditions. There may be resistance at 2,650, a move above that level will likely test for resistance at the long-term moving average. 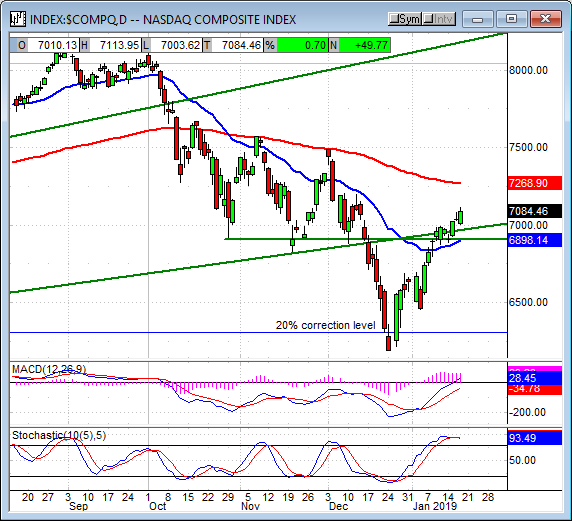 The NASDAQ Composite posted the third largest gain with an advance of 0.70%. 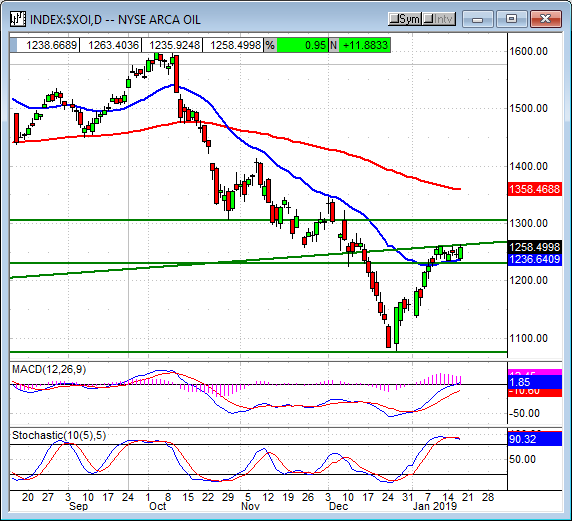 The tech-heavy index created a medium sized candle moving up from Wednesday's support to set a new high. 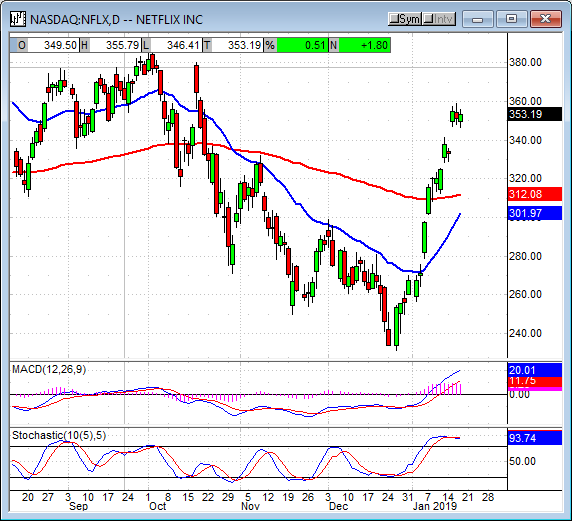 The index is supported by the indicators although results from Netflix may weigh on it in tomorrow's session. 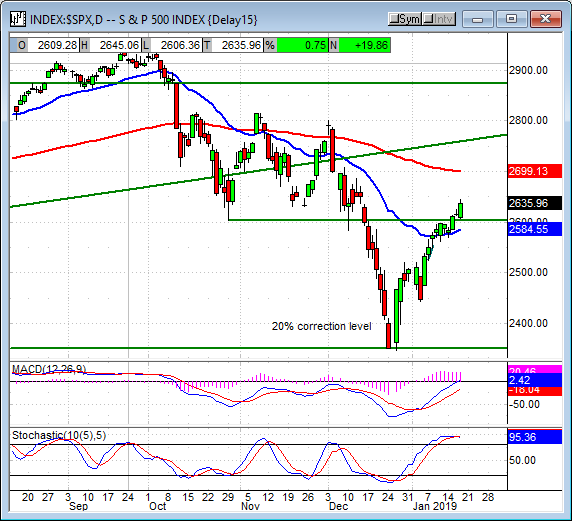 The indicators have begun to show some weakness that may result in a consolidation move or retest of support. 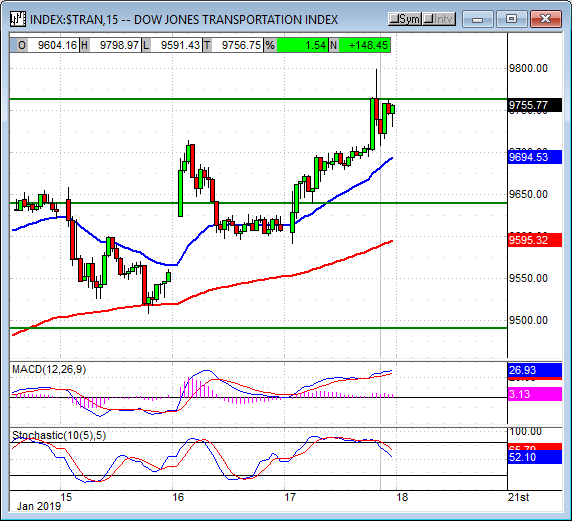 Support is at the short-term moving average near 6,700, so long as it holds the rally will likely continue. 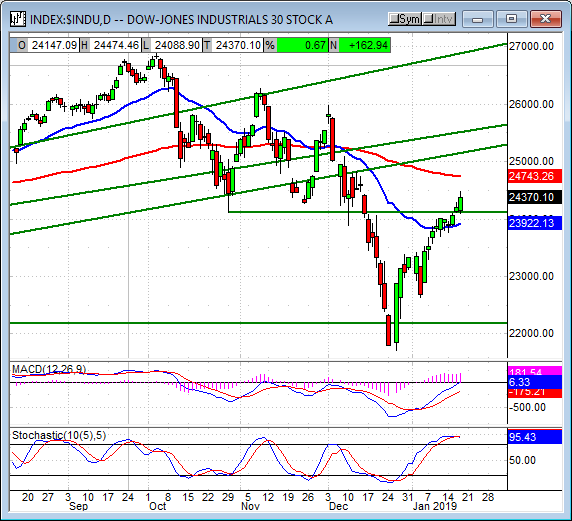 The Dow Jones Industrial Average brings up the rear with a gain of only 0.67%. The blue-chip index created a medium sized candle moving up from yesterday's support and looks like it will continue higher. The indicators are bullish and momentum is on the rise which is consistent with a bull-market rally. The next target for resistance is the long-term moving average near 24,750. The indices are moving higher, the move is driven by earnings, and the outlook for 2019 is getting better and better. Granted, the outlook for 2019 is still well-diminished from what it once was but the new outlook is more realistic and supported by strength in the consumer. We may see some more volatility, we may see the market retest for support but the bull market is intact and rising prices are my prediction for 2019. The only real risk is the trade talks, if trade negotiation falls apart global slowdown could deepen and we could see the recession everyone feared way back last month. Brexit could be a problem but so far it looks like the market has already priced in a hard exit from the EU, anything less would be good news. I am firmly bullish for the long-term, cautiously bullish for the near-term.